The key aspects of Diigo include Researching, Sharing and Collaborating which is why we integrated the headings of My Library, My Network and My Groups. My Library is where you can manage all of your bookmarks, and filter them so you can find exactly what you are looking for. You can search all, unread, public or private headings. My library also has the option to search for specific items through three different searches. 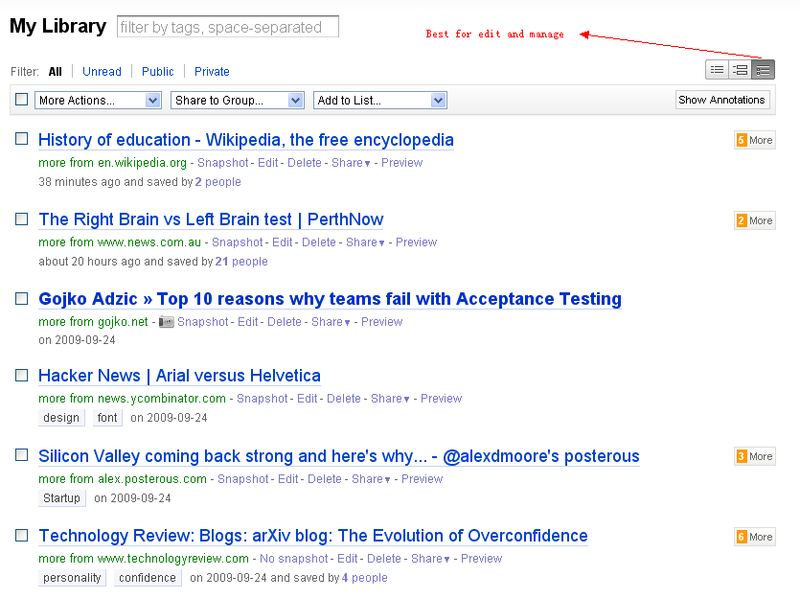 Ø Meta Search: This is where Diigo will search your entire library and is also known as the default search. Ø Tag Search: This method of search is more specific and lets you search only the tags of your library items. Ø Full – Text Search: This is available to premium users only in which allows users to search the entire body of a bookmarked page and cached pages. It helps to zone in on specific content within the bookmark itself. The tagging system at Diigo helps to filter all of your bookmarks so that your knowledge is organised more effectively. By selecting a tag category, you can view all of your bookmarks within that area. E.g. animals, literature, scenery. You can filter by type, order or lists to find your saved bookmarks with ease! Your library screen also gives you the option to sort out your bookmarks by selecting multiple items with the small check boxes on the right hand side of your bookmarks or you can select all at once, from there, you can delete your bookmarks with the trashcan icon. You can also revise tags from the more actions menu which allows you to add more tags to your existing bookmarks or replace them with new tags. Best for Browsing: along with your bookmark title, your snippets of information (highlights, sticky notes, clipped pictures, video, etc) are fully expanded for browsing.